Friday, April 6th is just days away and Tri-Force MMA is set to take over CES49 at Twin River Casino live on AXS TV’s Fight Night. With four of their star fighters on the roster, Tri-Force MMA is certain to impress with Nate “The Snake” Andrews (12-1), Gary “Batman” Baletto (5-1), Marquis Brewster (4-0) and John Douma (2-0). Andrews is prepared to take on opponent Chris “Taco” Padilla (9-3) of Gardena, CA for the CES MMA Lightweight Championship Title on his home turf this Friday night. Andrews fights out of his self-owned and operated MMA gym, New England Combat in Johnston, RI, but remains a longtime training partner and family to the team at Tri-Force MMA. Andrews has established a legacy within CES MMA Lightweight Division and the community is excited to watch him take his potential to the next level on April 6th. 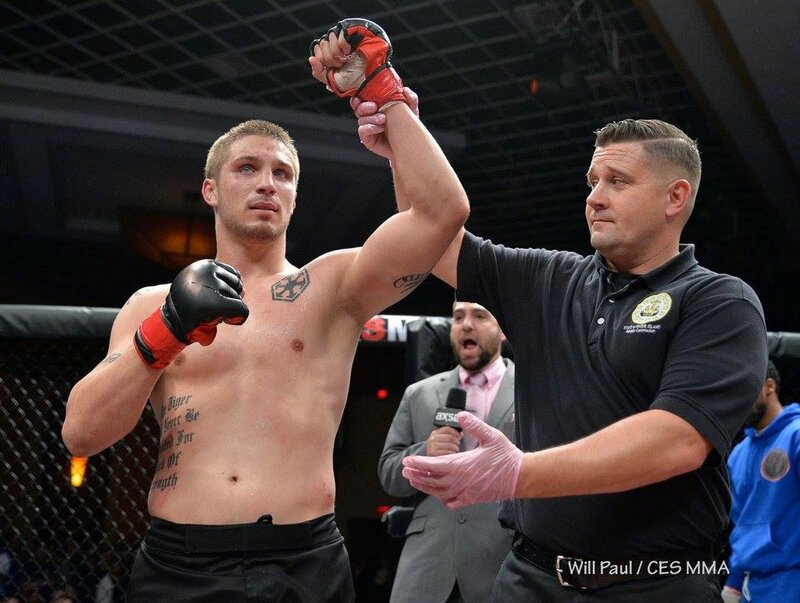 In a welterweight bout, “Batman” Balletto will take on Jermiah Wells (3-1) of Philadelphia, PA. Balletto returns to the cage just months after he and his wife Brittany welcomed their newborn son, Grayson, to the world this past February. Balletto’s dedication to fatherhood has only strengthened his momentum and drive to succeed, fueling his training camp to prepare for the win in all facets of the fight. Brewster’s highly anticipated return to the cage is certain to draw a crowd, as he presses forward to maintain an undefeated professional record. Taking on Tashawn Mack (6-2) of Lansing, MI in a bantamweight bout, Brewster’s diligent training regimen has prepared him to control to the matchup no matter where the fight goes in cage while dictating the pace. Douma will take on Zach Burhans (3-1) of Cortland, NY within the Bantamweight Division. Douma, a lifelong wrestler, has recently demonstrated through an impressive TKO finish that his long hours with famed boxing coach, “Diamond” Dave Keefe, are paying off big time. Coming off an impressive win, this young fighter’s skill and diversity in the cage is certain to leave his opponent wondering what is next. Douma remains a rising prospect within the region and will hunt for his third straight finish on April 6th. With a stacked card, Tri-Force MMA will come out with force this Friday, April 6th, filling the house with Tri-Force love and support. If you have not purchased your tickets yet, do so quickly, as this event is likely to sell out. Stop by the gym and look for any of the coaching staff to point you in the right direction for ticket sales to help support the Tri-Force fighters.